Note (Dec-2005): I'm not making the spacers anymore, but they're pretty simple — they are just big "washers" with an inside diameter of approximately 55mm, and an outside diameter of about 77mm. Don't make them any thicker than about 1/4" (6mm). Even a 1/8" (3mm) spacer makes a big difference. The stock shock is shown in the photo above. 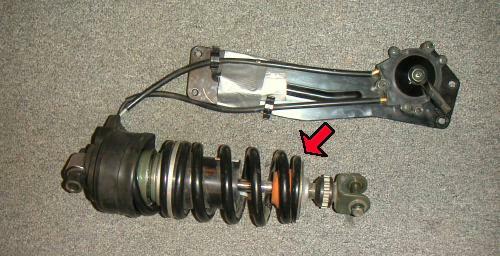 The spacer is going to go just below the spring at the bottom of the shock, at the point shown by the arrow. The rubber boot is pulled up in this photo, to show the "HARD/SOFT" adjuster mechanism. You should install only one of the three spacers. Do not under any circumstances install more than 1/4" of spacer! Doing so my prevent the shock from operating properly, and will certainly prevent the preload lever from working. If you want your shock tuned for best solo riding, start with the 1/8" spacer if you weigh less than about 230 pounds. If you weigh more than that, start with the 3/16" spacer. If you're unsure, start with a 1/8" spacer. Even just that makes a huge difference. If you want to tune your shock for 2-up riding, and the combined weight of both rider, passenger and luggage is less than 250 pounds, start with the 1/8" spacer and go for a ride. You can always go to a thicker spacer later. The 3/16" spacer is probably good for combined weights from 230 to maybe 400 pounds. Beyond that, try the 1/4" spacer. If that isn't enough, you'll need a different solution, like stronger springs or an aftermarket shock. You may prefer to loosen the dog bone bolt with the bike on the sidestand, as there is more interference when on the centerstand. Remove the four bolts (2 Allen bolts on each side of the frame) that attach the bracket which holds the preload adjuster. A 5 mm Allen socket with a 1" extension will make this easier. You can leave the preload adjuster attached to the bracket. 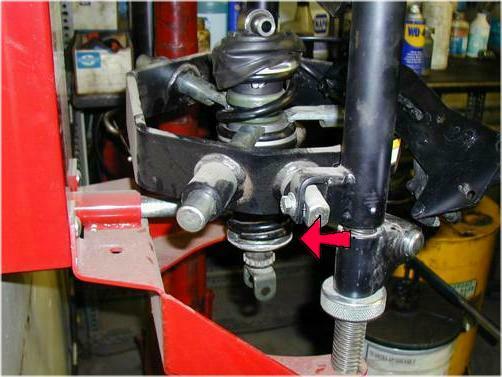 Remove the shock absorber attchments, first the lower bolt, then the upper bolt. There is a small spacer on the top mount that will probably fall out -- don't loose it! Remove the shock absorber downwards, through the hole in the swingarm. Ideally you are going to want to find a friend or a shop with a professional spring compressor. Almost all shops that work on RVs and trucks will have such a tool. It takes just 5 minutes or less to do this, so you may get it done for free or for just $5 or so. Some shops, however, may want to charge you some minimum fee, like 1/2 hour of "shop time". It may pay to call around and explain what you need done. Don't try to do this in your garage with home-made tools. The spring is quite strong and the chance for having a painful accident is too great. Find somewhere that has the correct tool and use it. Use a professional spring compressor to compress the lower spring, and slip off the circular spring retainer. Scott McDaniel wrote to tell me that Harbor Freight sells a Coil spring compressor for about $11 that works fine for this application. 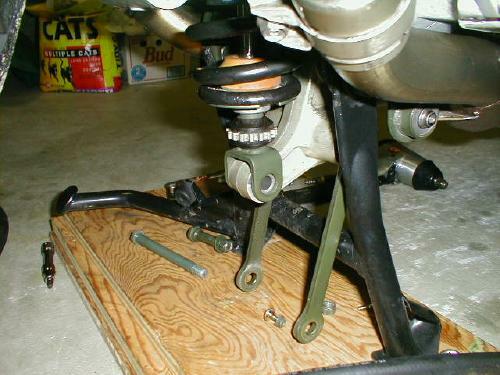 (instead of the expensive shop unit shown in the photo above) He wrote: "The way I used them was to put the two-hook end around the bottom of the bottom spring and then hook the single-hook end on the pressed-in spacer for the top shock mount. I then slid the top bolt back through to make sure the single-hook ends wouldn't slide off. Worked like a champ, very safe, and allowed me to do this task in the comfort of my garage." Insert a single spacer below the lower spring (see arrow in above photo), and reinsert the spring retainer. Carefully remove the shock from the spring compressor. Reposition the preload adjuster bracket. Reposition the shock absorber, and attach the upper bracket of the shock. Torque to 64 Nm (46 ft-lbs). Don't forget the small spacer that goes on the top mount! Attach the lower bracket of the shock and torque to 40 Nm (29 ft-lbs). Fit the link arms back to the triangle link. Torque to 48 Nm (35 ft-lbs). Replace the 4 preload adjuster bracket bolts.